The new Hulu series Shrill is a fun, provocative binge-watch: The six episodes that constitute the show’s first season have recently dropped, and feature Saturday Night Live’s Aidy Bryant as Annie, a young woman making her way in Portland, an assistant calendar editor trying to launch her own writing career. It’s based on the memoir by Lindy West, who was a writer for Jezebel (a Takeout sister publication). Bryant, like West, is overweight, and a lot of the series explores how this affects her relationships with people like a prospective boyfriend, an online troll, her boss, and her parents. Annie’s wardrobe is a key part of this exploration. At the start of the series, she is wearing dowdy colors, then her dresses and outfits get brighter as she begins to stand up for herself more. As a dress fan (a neighbor once thought I must have been religious—ha!—because I wore pants so seldom), I was salivating over Annie’s brightly colored boat-necked above-the-knee dresses, which I would totally wear just about every day. And the sequined dress above, which she wears to a fancy work event, is to die for. So true! For the record, I’m a size 12, and still have a hard time squeezing my hourglass figure into boutique stores in my neighborhood that barely have anything above a medium (heads-up, store: You’re in the midwest!) 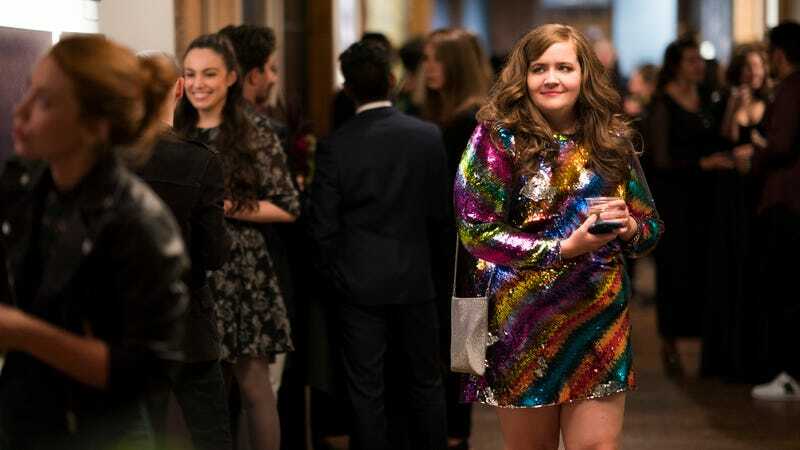 I would absolutely buy Shrill dresses online; I think Needham should create her own line, as she already has received some great promotional advertising via the show. So be sure to check out the funny and insightful Shrill on Hulu, then read about those eye-catching clothes over at Vox.